SEOUL, Sept. 13 (Yonhap) — Former major league pitcher Felix Doubront has been released by his South Korean club, putting an end to a roller-coaster season. The Lotte Giants of the Korea Baseball Organization (KBO) placed the 30-year-old left-hander on the waivers Wednesday evening. The Venezuelan was only 6-9 with a 4.92 ERA in 25 starts in his first KBO season. Doubront brought a career big-league record of 31-26 with a 4.89 ERA. He won 11 games for the Boston Red Sox in both 2012 and 2013, and won the World Series in 2013. 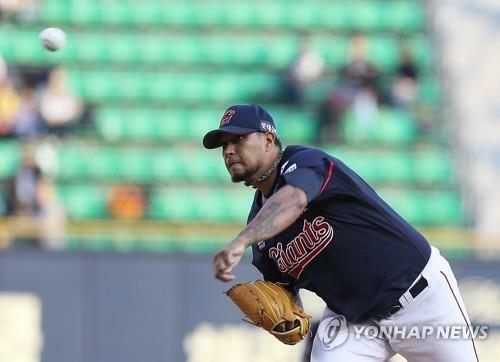 He had a promising start to his KBO stint, limiting opponents to one run over nine innings in spring training with eight strikeouts and two walks. But it was a much different story in the regular season: He was 0-4 with an 8.37 ERA in his first five starts and had more walks (20) than strikeouts (18) in his first 23 2/3 innings. The Giants parted ways with American right-hander Josh Lindblom after last season and acquired Doubront to fill that void. And in a development certain to drive an already frustrated Lotte fan base mad, Lindblom leads the KBO with a 2.93 ERA and a 1.06 walks, and hits per innings pitched (WHIP). He’s also second in wins (14), third in strikeouts (152) and fourth in innings pitched (162 2/3). Doubront showed some signs of life in May and June, going 5-0 in nine starts across those two months with a 2.45 ERA in 58 2/3 innings. But the left-hander went 1-5 over his last 10 starts and was touched for 10 earned runs in six innings in his two September outings that sealed his fate. The Giants (52-64-2 in wins-losses-ties) remain well out of postseason contention, as they trail the LG Twins by 5.5 games for fifth place and the wild card.